The redefines the youth bedroom with fresh design and function in classic Soft White finish. Signature large storage bins feature a fun tilt-forward look and swooping contoured edges. For ultimate organization, individual card holders are mounted directly above each storage bin to highlight what goes where - from small to large toys, books or even clothes. A curio style shelf near the top of the headboard provides a home for stuffed animals or other soft accessories. Large, friendly wooden knobs round-out the look, providing the perfect finishing touch to the perfect kid-ready room. 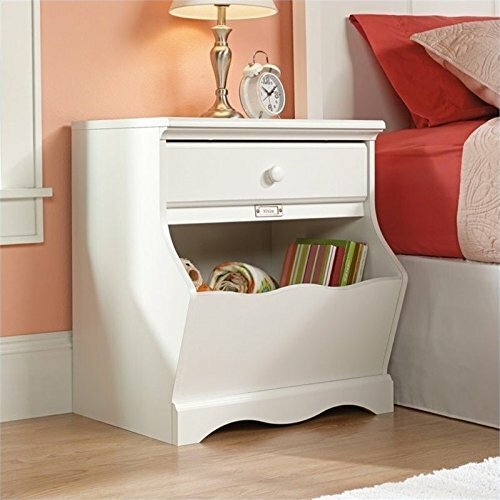 Features: Soft White finish; Drawer with metal runners and safety stops features patented T-lock assembly system; Storage bin features ID tag; Detailing includes solid wood knob. Specifications: Overall product dimensions: 26" H x 23 1/2" W x 18 1/4" D.